Track & Court Resurfacing Raleigh | Americourt, Inc.
Americourt, Inc. began in 1988 as a small court construction company serving clients throughout North Carolina. Since then we expanded both our service areas and our product lines of sports surfaces to include Hurricane Running Tracks, Multipurpose & Weight Room Floors, and Outdoor Basketball Courts. 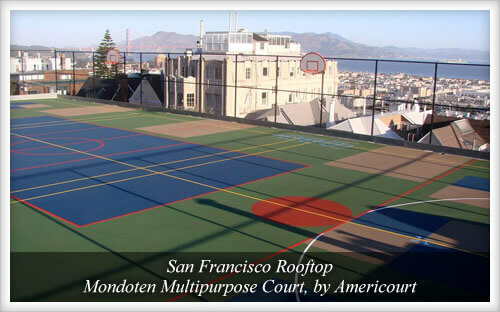 We partnered with world-renowned Mondo, Inc. to design and develop MondoTen, the most innovative and versatile tennis court surface on the market. We specialize in all types of sports court resurfacing, construction, repair, and maintenance. Our approach to business is simple - provide the highest quality product, and always ensure our clients' total satisfaction. The Americourt Family of clients ranges from single family homes to prestigious universities. Never forgetting that each client, no matter what size, helped to make us who we are, a company dedicated to each and every job, and with a reputation we can be proud of. This is our company's informal mission statement, the very business model that has continued to bring us repeat business. Last year the Bald Head Island Club hired Americourt to rebuild our tennis facility. The results have been absolutely phenomenal. The Mondoten surface has been down for about a year and the reaction from our members and guests has been extremely positive.